In the jungle of bicycles, our e-bikes have priceless animal names like Chamäleon, Gazelle and Nashorn, the German word for Rhino. I understand that the risks of Electrical Bicycle are numerous and include, but are not limited to, the following: DEATH, PARALYSIS, HEAD INJURIES, BROKEN BONES, CUTS, SCRAPES, DAMAGE TO BIKES, GEAR, AND CLOTHING, AND CAUSING DAMAGE TO AND/OR INJURING OTHERS; falling; loss of control; encountering trees, limbs, brush, rocks, structures, ropes, barriers, or other man-made or naturally occurring obstacles; encountering unpredictable terrains such as varying steepness, mud, holes, cliffs, gravel, narrow trails, and/or lack of trails; negligence of other riders, persons, or vehicles. I have made no misrepresentations to EccoBike™ in any regard, including, but not limited to, my height, weight, age, abilities, or bike type. All instructions for the use of any electrical bike(s)) have been made clear to me, and I fully understand how to use the bike. I accept the electric bike for use as is, and accept full responsibility for the care of the electric bike while it is in my possession. A copy of the Instructions for Use is attached as Exhibit 1 to this agreement and waiver. I have Reviewed and understand the instructions in exhibit 1. III. I have a helmet or one has been provided to me and I will wear a helmet every time I ride the Electrical Bike. I understand that wearing a helmet may decrease the risk of head injury. The Bike as given to me is working properly. I am physically and mentally able to ride the bike and I am familiar with an electrical bike riding and its physical and mental requirements and risks involved. I will read and follow all instructions and signs. I agree that the EccoBike™ will not be responsible for the unsafe use or any violations of the terms of this agreement and waiver. If I have used or ride an Electrical Bike from EccoBike™then I agree that I am fully responsible for all damage or loss to the bike and agree to pay for all repairs or for the replacement cost of the bike, if lost, stolen, or damaged. Release of all Liability (including negligence). I AGREE TO FULLY RELEASE AND DISCHARGE ECCOBIKE FROM ANY LIABILITY for any damages, injuries, or claims, including any injuries or damages occurring from any negligence of the tomyself or any other person or property, as a result my participation in electrical bike usage, or one of EccoBike’s bike riding. I fully understand and agree to release the EccoBike™ for its negligence in causing in whole or in part any injury to me. I EXPRESSLY ASSUME ALL RISK OF LOSS, DAMAGE OR INJURY OCCURRING AS A RESULT OF PARTICIPATING IN USAGE, AND/OR ELECTRICAL BIKE RIDING, INCLUDING THE RISK OF ECCOBIKE NEGLIGENCE. Promise Not to Sue and Hold Harmless. I AGREE NO LAWSUIT WILL BE FILED BY ME OR ON MY BEHALF AGAINST ECCOBIKE as a result of my participation in bike try-out, or purchasing an EccoBike. If I do file a lawsuit, I agree to pay any attorney fees, costs or judgments incurred by EccoBike even if EccoBike is found negligent. I FURTHER AGREE TO INDEMNIFY EccoBike™ AND HOLD IT HARMLESS FOR ANY DAMAGES, INJURIES, JUDGEMENTS OR LAWSUITS, including any attorney’s fees and costs incurred by EccoBike™ as a result of my use of the bike or any lawsuits resulting from my use. I agree my obligation to indemnify and hold harmless applies even if EccoBike is negligent. I understand this is a contract, which limits my legal rights, and it is binding upon me, my heirs and legal representative. If portions of this agreement are invalid, it is agreed the remaining portions will remain intact and enforceable. By signing or reading the Release of Liability, the undersigned acknowledges she or he has fully read and understands the above and foregoing. All Riders under the age of 18 years are required to have a parent or legal guardian read and also sign this Release: The parent and the Rider have read, understand and agree to comply with this Release. By signing this document, the parent or guardian agrees to each of the provisions above, including to indemnify and hold EccoBike™, its agents or employees harmless from any and all claims brought by the Rider or resulting from the Rider’s actions, whether EccoBike, its agents or employees are negligent or not. The parent or guardian has reviewed the instructions for use attached as Exhibit 1, has reviewed them with the Rider had certifies that the Rider is familiar with the instructions and has shown to the parent or guardian that Rider can safely and competently use the equipment. 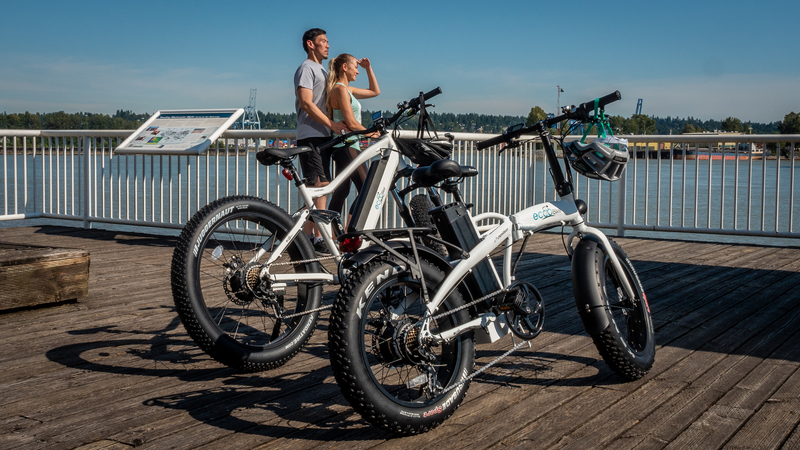 Please note that all information regarding the expected range on a single charge on one of our electrical bicycles “e-bikes” is an estimate, not a guarantee. There are many factors that contribute to the actual, real-world range for an electrical bicycle “e-bike” battery such as the age of the battery, temperature, level of assist, speed, payload, and terrain. Given the right conditions, it is possible to get less than the expected minimum range or greater than the expected maximum range.